During the 2018-19 two schools in two different districts were the recipients of the Dance Education grant awarded by the Maine Arts Commission (MAC). 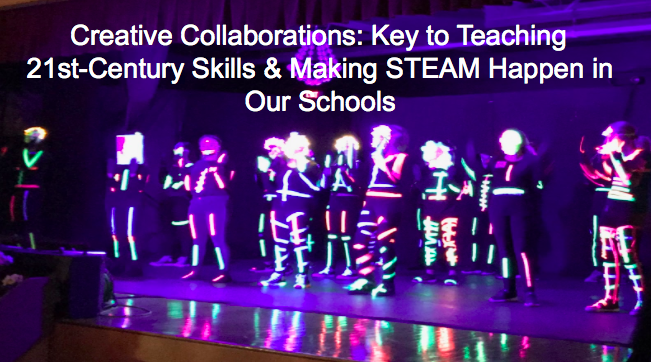 Freeport High School and Maranacook Middle School created amazing units that impacted hundreds of students in Grades K-12. Freeport High School was highlighted in yesterday’s blog post with a description of the dance education opportunity that was provided during this school year. This blog post describes the dance education program that took place at Maranacook Middle School this school year. 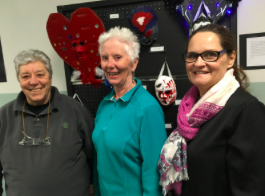 It is wonderful to see what occurred when teaching artist Nancy Salmon, art educator Hope Lord, and gifted and talented teacher Pat Godin collaborated! This is a great example of learning in STEAM (Science, Technology, Engineering, Art, Math). Thank you to Hope and Pat for providing the plethora of information for this post – the story and resources! My original idea was to have students create masks and then have them add lights with Little Bits electronics. However, after collaborating with Pat, we decided to teach the students about light circuits and how to soldier their own circuits. This allowed us to integrate science with the electricity and engineering with the design process. For math we introduced proportions as we discuss the features of the face and how to construct the masks and giving students the choice to increase the proportions of the face to make their mask more visible to the audience. We also provided students a variety of mask making materials, including a new medium called Thibra. This is a thermoplastic sculptable material that costume designers and special affect artists use in designing masks and costumes. The students used the heat gun to soften the material and then molded it around sculptural pieces that were added to their masks. We showed the students examples of dance groups who performed in the dark with lights and the students wanted to incorporate black lights and glow in the dark paints in their masks and dance. As our dance choreography progressed, the students and Nancy determined which segment of the dance would be performed with lights on and which segment would be performed in the dark with black lights. The students started planning their masks with a group brainstorming activity called “brainwriting” where they all charted ideas of how they could represent themselves and their role in our school community. 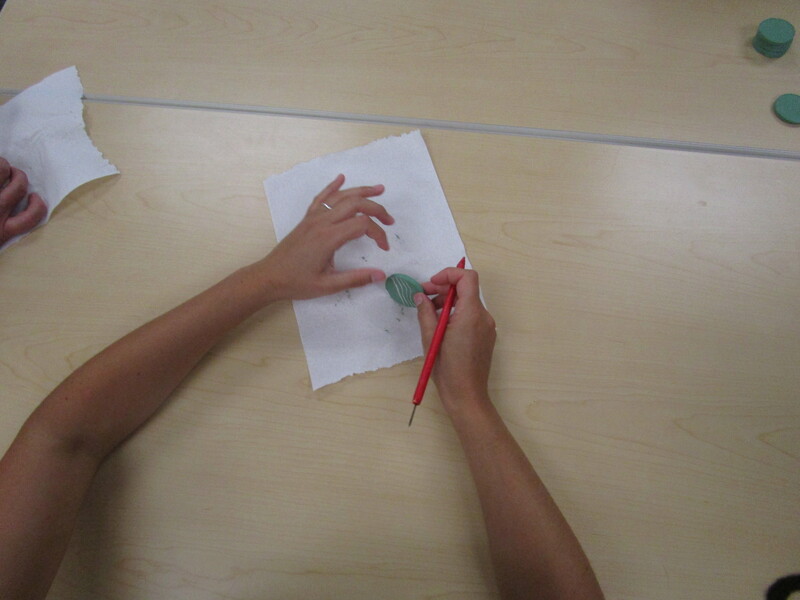 Students could add to other students’ ideas or write new ideas. Then students charted 12-15 ideas to help them plan their mask theme. The individual and small group dances came about through the students exploration of dance movement as a means of communication. Nancy helped the students experiment with movement and determine which movements could help them express their role and what their mask was communicating. For example, one student had a camera on her mask because she spends a lot of time taking photographs. She incorporated gestures that communicated someone taking photos. Next, the students worked in small groups and collaborated to create a dance routine that incorporated each of the students individual dance movements. Nancy, Pat, and I also wanted to have the students end the dance as a community with the group dance. Our goal was for the dance to communicate that even though we all have individual interests and perceived roles, we are one school community. Nancy introduced the dance collaboration project before we performed our dance since Pat and I were back stage with the students waiting to dance. We did not provide an audience handout because our dance was part of our Arts Night Celebration and listed in the program given to parents. The focus of the entire night was to advocate, educate, support, and celebrate the arts. That is why we chose this event to have the students perform their collaborative mask/dance performance. We feel our project communicated the value of teacher collaboration across content areas, including the Arts. NCAS:CR2: Organize and develop artistic ideas and work. CR3: Refine and complete artistic work. Pr5:Develop and refine artistic techniques and work for presentation. Research on this phenomenon is confirmed by Kyung Hee Kim. Kyung is a professor of Innovation & Creativity at the College of William & Mary. “In the last 20 years, children have become less emotionally expressive, less energetic, less talkative and verbally expressive, less humorous, less imaginative, less unconventional, less lively and passionate, less perceptive, less apt to connect seemingly irrelevant things, less synthesizing, and less likely to see things from a different angle (Kim, 2011). Learning to solder – I DID IT! The Dance Education grant is the only MAC grant that is a grass-roots effort grant. Several dance studios and two high school dance programs have a fund raiser each November. The money raised is what funds the dance education grant at the Commission. Without the dedication and commitment of many educators, dancers, parents, and community members this grant would not be possible. Special thank you to Thornton Academy Dance Educator Emma Arenstam Campbell for her contributions to being instrumental in making the Dance Education grant possible. On March 11 on Scott Simon’s public radio show, Weekend Edition Saturday, Mr. Simon interviewed Veronica Miller Jamison. She’s illustrated a book called “A Computer Called Katherine”, it was written by Suzanne Slade. Katherine Coleman Goble Johnson is an African-American mathematician whose calculations of orbital mechanics as a NASA employee were critical to the success of the first and subsequent U.S. manned spaceflights. 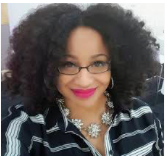 Veronica Jamison is a living example of why the arts should be and how they are connected to STEM. I found the interview very interesting and I hope you’ll take 5 minutes to listen to the show or to read the transcript at THIS LINK. Below is one question and answer from the interview. 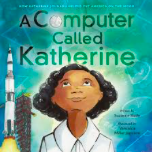 SIMON: Do you hope that reading this book about Katherine Johnson and seeing your wonderful illustrations can set something off in young readers? JAMISON: Yeah, absolutely. I mean, there is a huge push to get more girls and more children of color into STEM, which is very important in getting those young minds involved in thinking about, you know, math and science and how that works in the world and how it can make the world a better place. And I hope that children see the writing too and think the same thing about telling stories. And I hope they see the art too, and they think the same thing about painting and making art because, to me, all of it is crucial in – not to sound cliche, but it’s all crucial in making this world kind of a brighter, better place. 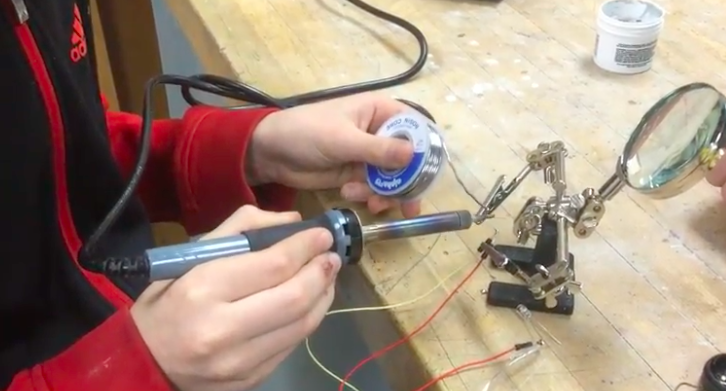 To keep up with the changing global economy, and satisfy Maine’s urgent need to create a technically capable workforce, we need to offer new approaches to hands-on STEAM learning. 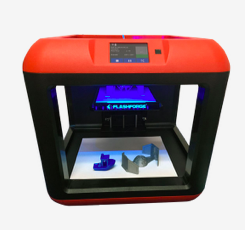 An effective way to accomplish this objective is to continue to expand the use of three-dimensional (3D) printing and design in Maine’s K-12 schools, which has grown rapidly over the past several years. Come learn how 3D printing and design can help to meet STEAM learning targets at the first annual 3D Printing Expo to be held on April 27 at Thomas College. 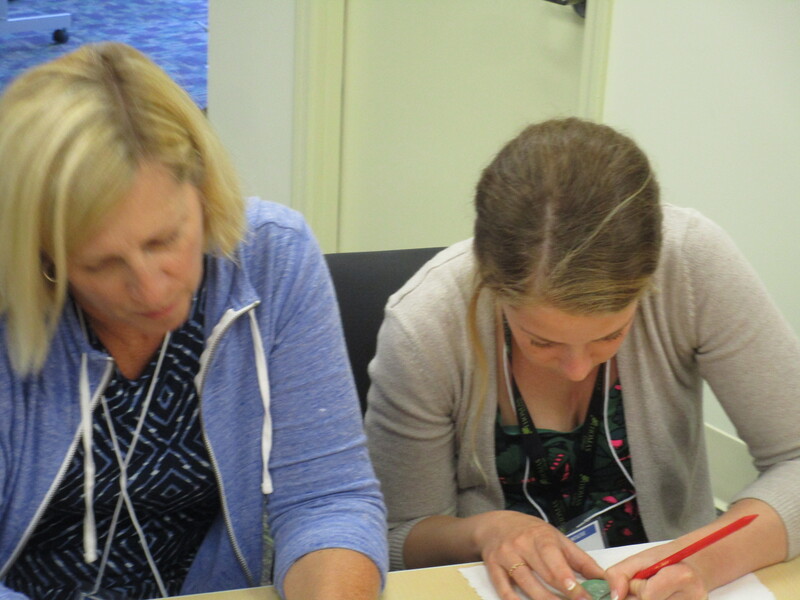 This event, sponsored by the Thomas College Center for Innovation in Education, is open to Maine teachers, technical directors, school librarians and administrators engaged in or interested in expanding the use of 3D printing and design. 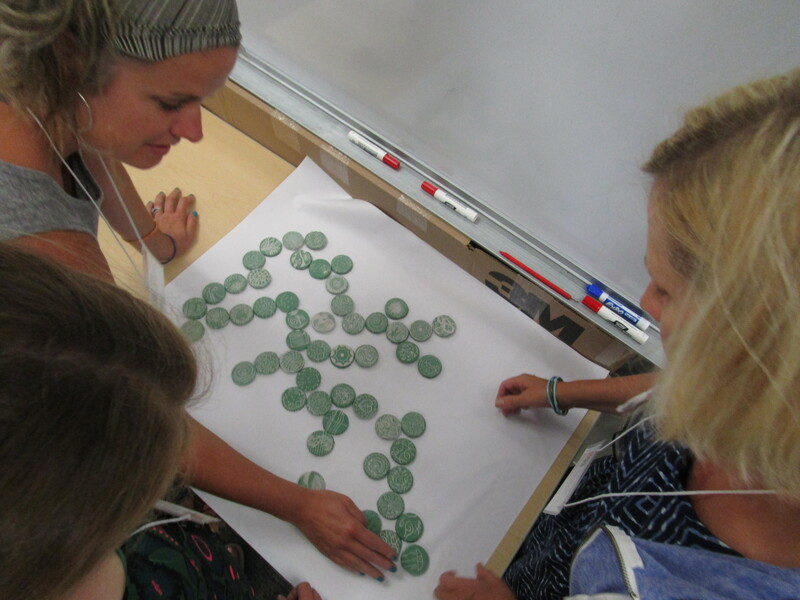 To create a network of teachers and students engaged in three-dimensional printing and design. To document and share success stories and challenges related to three-dimensional printing and design in K-12 settings. To publicize resources and ideas for teachers and schools interested in adopting three-dimensional printing and design. To engage teachers and students in the professional work for publicly sharing their practice. 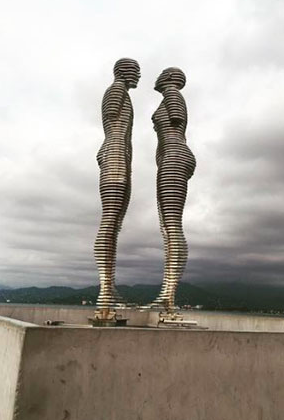 This is an amazing sculpture, “Man and Woman” located in the seaside city of Batumi, Georgia. 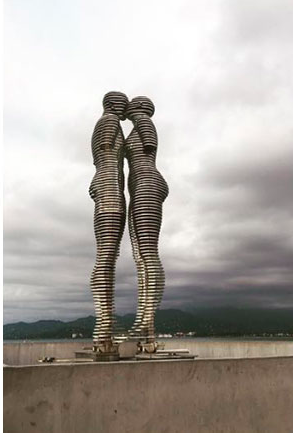 The sculpture is 26 feet high, constructed out of steel and moves. The Georgian sculptor is Tamara Kvesitadze. The Statue of Love sculpture is inspired by the love story of “Ali and Nino”. The story is similar to Shakespeare’s Romeo and Juliet and tells of an Azerbaijani youth who falls in love with a Georgian princess but dies defending his country. The novel was written in 1937. You can view more of Tamara’s art work. Information about the sculpture is located at THIS LINK and you can view the video of it moving. This is a wonderful example of the connection between art and engineering. 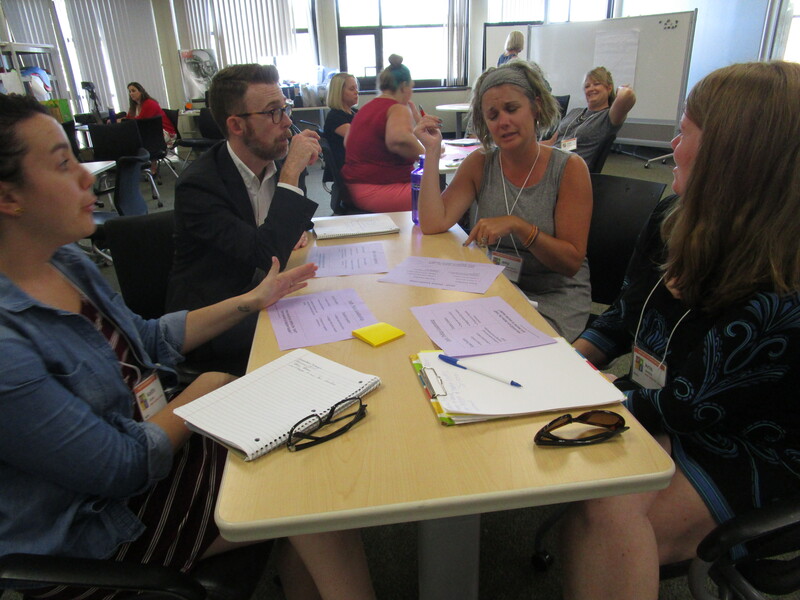 Thomas College is in the midst of gearing up for the 2018 CIE Summer Institute scheduled for June 26 – 28, 2018. The theme is “Innovating In Education for Maine’s Diverse Population of Students,” with a focus on Digital Learning, STEAM, and PBE. 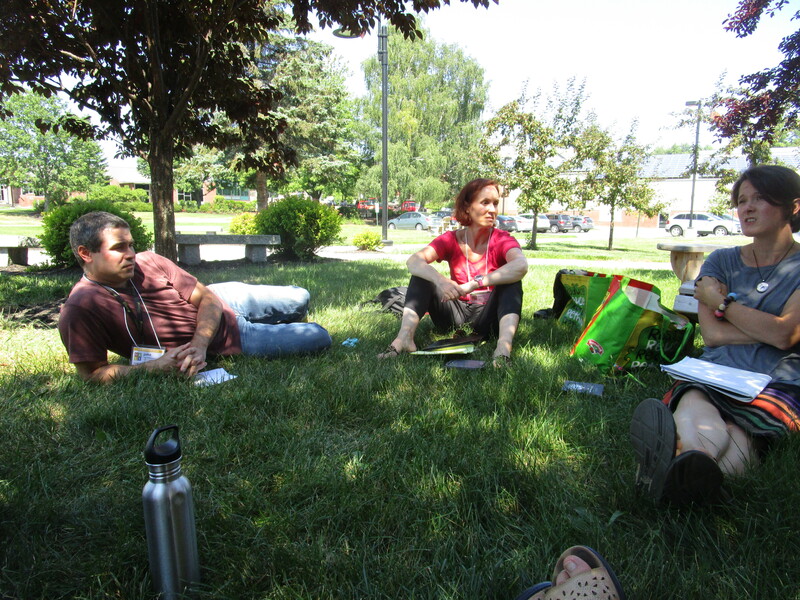 You can learn more at the CIE Summer Institute website and on the Thomas College CIE homepage. More information will be added as it becomes available. Early bird registration costs $175.00, and ends February 1st, 2018. The regular event ticket price will be $195.00, and this cost takes effect starting on Feb 1st, and will run through June 1st, 2018. Registration is available at Eventbrite. Learn more about the school and curriculum by reading the ENTIRE ARTICLE. Day 2 kicked off with an amazing STEAM presentation from Kate Cook-Whitt. The opening was titled This is your Brain on Art: Neuroscience and the Arts – “Examining the World Through Different Lenses: Art and Science”. 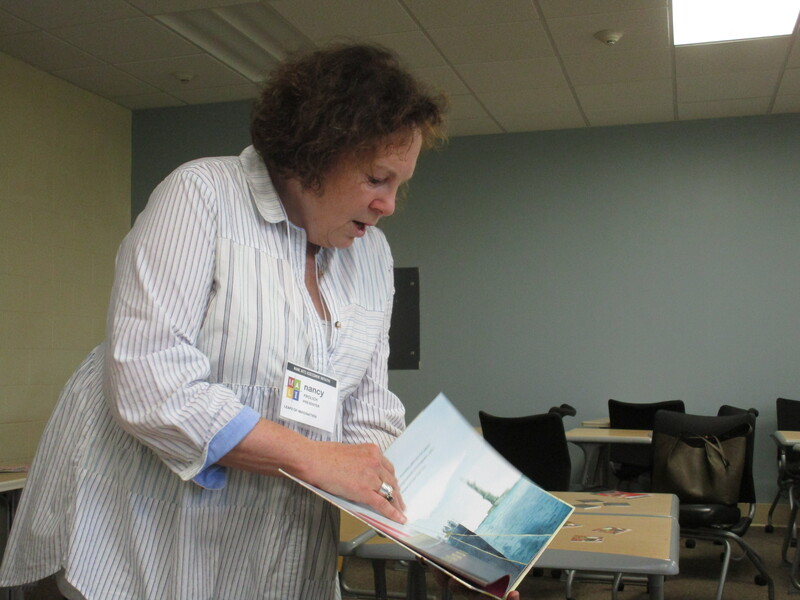 Kate is an Assistant Professor of Education at the Center for Innovation in Education (CIE) at Thomas College. 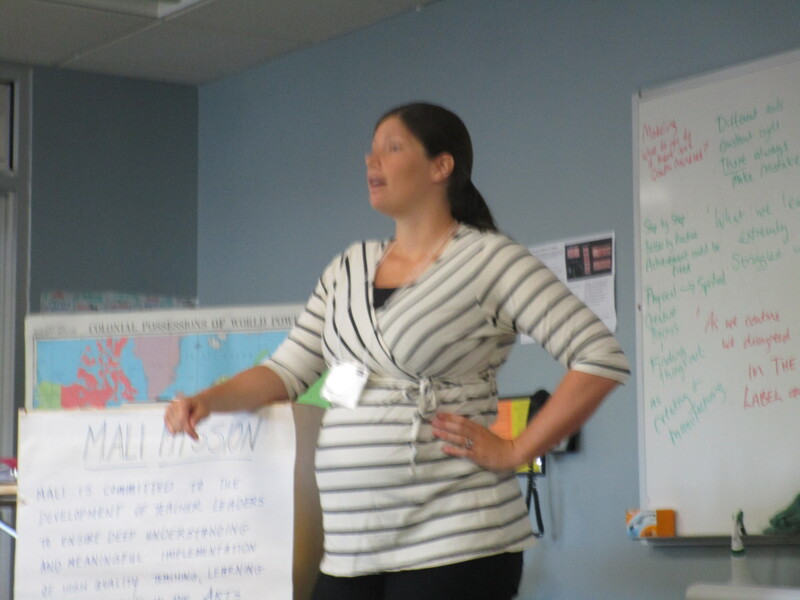 Participants agreed that Kate’s presentation was outstanding! 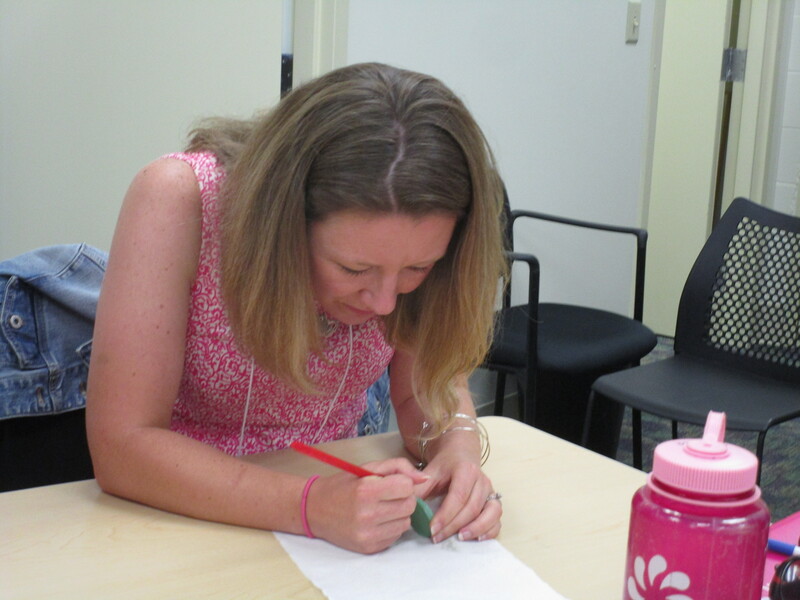 In addition Bronwyn Sale and John Morris provided a session called Teaching for Creativity. The afternoon brought all three strands together (teaching artist leaders, new PK-12 teacher leaders and returning PK-12 teacher leaders) for a session with teaching artist leader and potter Tim Christensen. We engaged with a small medallion of clay using the process Tim is so in tune with: sgraffito. The rest of the afternoon was spent on leadership, advocacy, and putting it into action on the follow up plans for the next year. 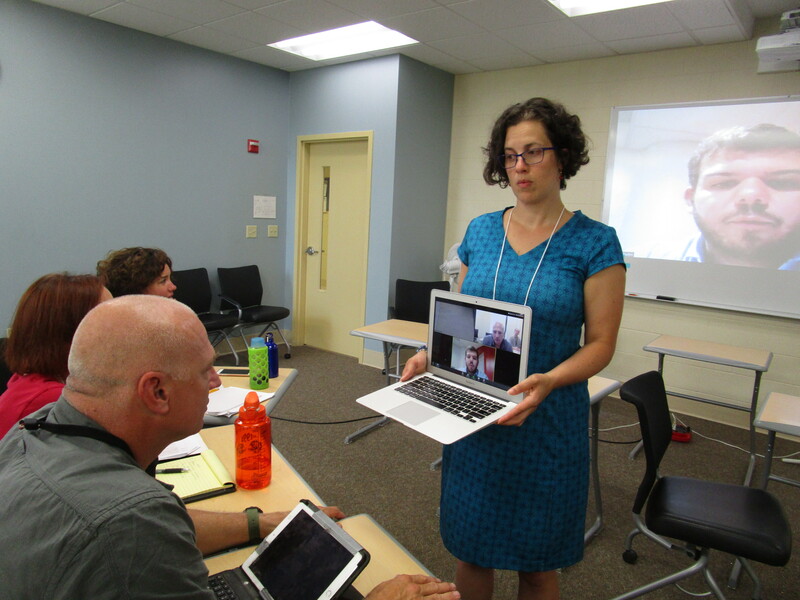 Strand 1, the Teaching Artist Leaders met with Jeff Poulin, electronically, from the Americans for the Arts. 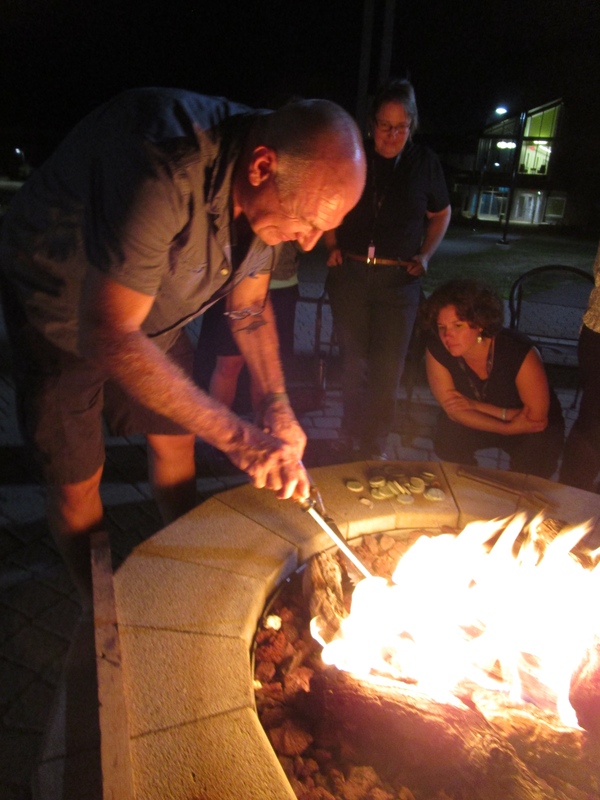 Day turned into night and educators gathered around the Thomas College fire pit for drumming and a chance for Tim to fire the clay pieces created earlier in the day in the propane fire pit. This provided a wonderful opportunity to connect with colleagues from across the state. What a great way to end an outstanding day! 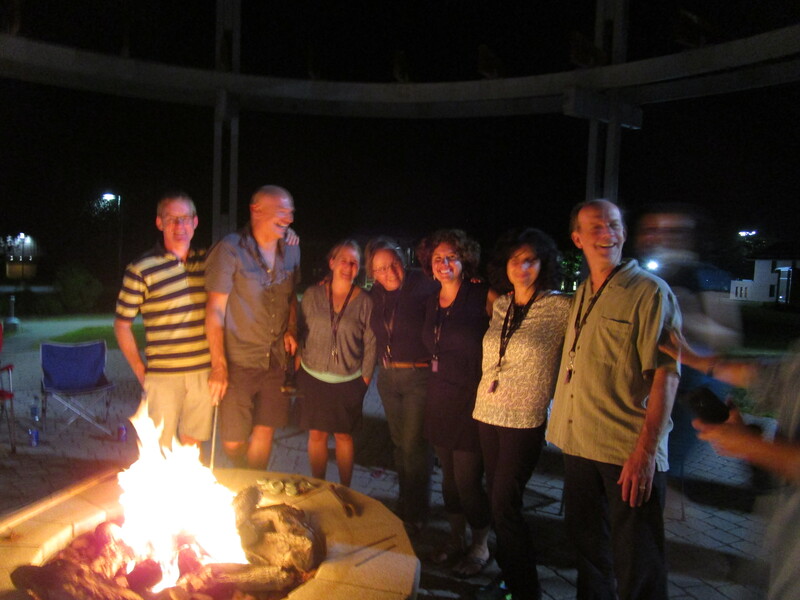 Fun around the fire pit!